Hello! It's time for a new Mojo Monday sketch (#175)! I tend to make a lot of vertical cards, so this horizontal sketch was really fun to work with.. I hope you aren't getting tired of Valentine's Day / Love cards.. I usually don't send out a lot of Valentine's cards, but this year, I've really been getting into the hearts and fun lovey dovey products! I was inspired by the colors (Pink, Grey and Black) in the Echo Park - Be Mine collection. 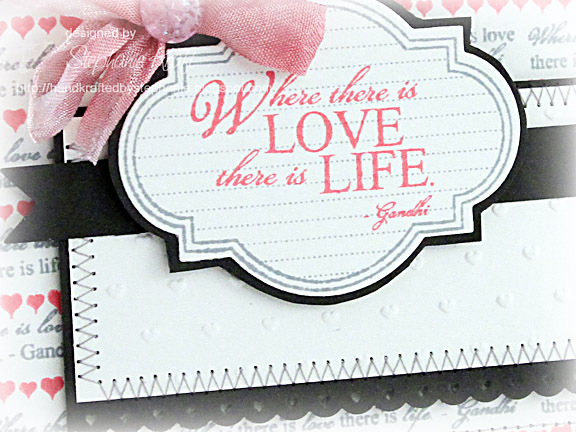 To create my background paper, I alternately stamped the Gandhi quote "Where there is love there is life" (from Verve's Text Objects) in Memento London Fog and the strip of tiny hearts (from Hearts on Fire) in Memento Rose Bud. For my main sentiment panel, I stamped the frame from Love Notes and cut it out with the matching Classy Label die. I then stamped a larger version of the same quote on the label. I hope you will play along with us this week! Please visit the Mojo Monday blog for all the details and to see the wonderful creations by the Mojo Makers! You can also visit their individual blogs for more details (see my sidebar for links to each). Accessories: Classy Label Die (Verve), Double-Ended Banners die (Papertrey Ink), Round-It-All (Zutter), Mini Hearts border punch (Martha Stewart), Love Language embossing folder (Provo Craft), Seam binding ribbon, Glimmer Mist (Tattered Angels), Sparkler (Webster's Pages), Heart trinket pin (Maya Road), Foam tape, Thread, Sewing machine. Love the dp background you made. The sentiments pops on top of the classy label jotted die/stamp. Wonderful card!! This is beautiful - I love the sentiment on the card. And the backing paper is just fab! So pretty, Steph! 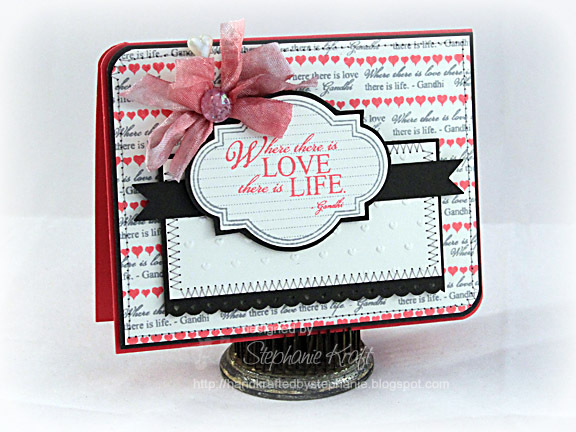 Love the shabby ribbon and that cool stamped background! Gorgeous design! Your collection of papers are fabulous and you always know how to put them together into a fabulous design!